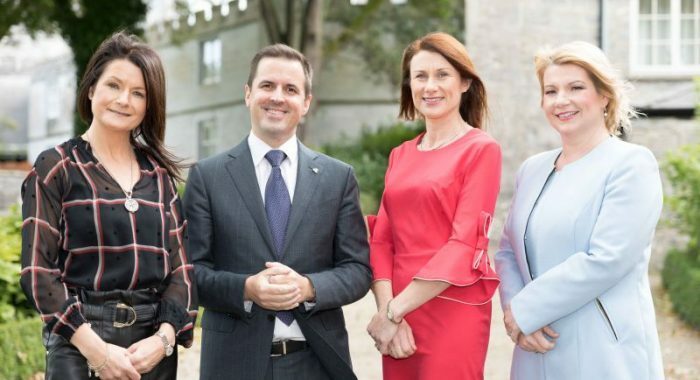 Martin Shanahan, CEO, IDA Ireland pictured at the Shannon Chamber lunch with (from left): Helen Downes, CEO and Mary Considine, president, Shannon Chamber and: Joanne McEnteggart, managing director, Corporate and Institutional Services, First Names Group Ireland. Photo: Eamon Ward. 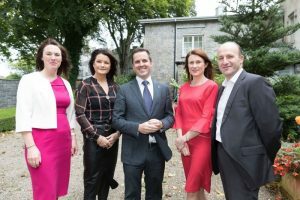 “The work that IDA Ireland does to attract foreign direct investment to Ireland and Enterprise Ireland do to support Irish businesses is vitally important to ensure that Ireland continues to attract and retain leading-edge companies,” said Shannon Chamber president, Mary Considine, in her opening remarks to the Chamber’s autumn lunch in Dromoland on Friday. 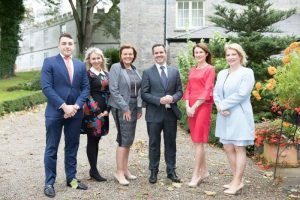 The keynote speaker at the lunch, held in Dromoland Castle Hotel and sponsored by First Names Group Ireland, was IDA Ireland’s CEO, Martin Shanahan. Citing factors such as a skilled workforce, good universities, good air and road connectivity, affordable housing and a region that offers a good work-life balance that influence an FDI company to located in an area, getting the message across that the Mid-West region is second to none as a place to live, work, learn and spend leisure time is paramount. “This requires collaboration and partnership particularly in the light of the challenges that Brexit is likely to throw up.” Ms Considine added. “That’s why we, as a Chamber, need to ensure that the Government fully implements its vision for Ireland 2040 and that the funding is in place to continue to support the positive shift toward regions, as set out in the National Planning Framework and the plan to create 2nd tier city regions working towards a more balanced national economy. “Regional development is not about equity; it is about turning our unique regional strengths into opportunity. Shannon and the wider community have a track record, the talent, an existing cluster of cutting-edge companies and connectivity that links people from Shannon through Limerick, Ennis and Galway to create the Atlantic Corridor. 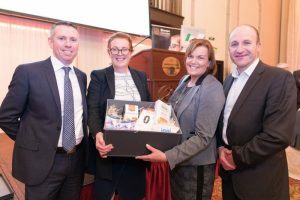 “We have the connectivity that enables people and products along the corridor to move by air through Shannon Airport and, we have the belief, the passion and sense of place, which combined with business capability, contribute to helping IDA Ireland win new business for Ireland,” stated Ms Considine.